An original nameplate for what is probably the most famous steam engine in the world, the Flying Scotsman, has sold for a record price of £64,500 (plus 12% buyer’s premium). 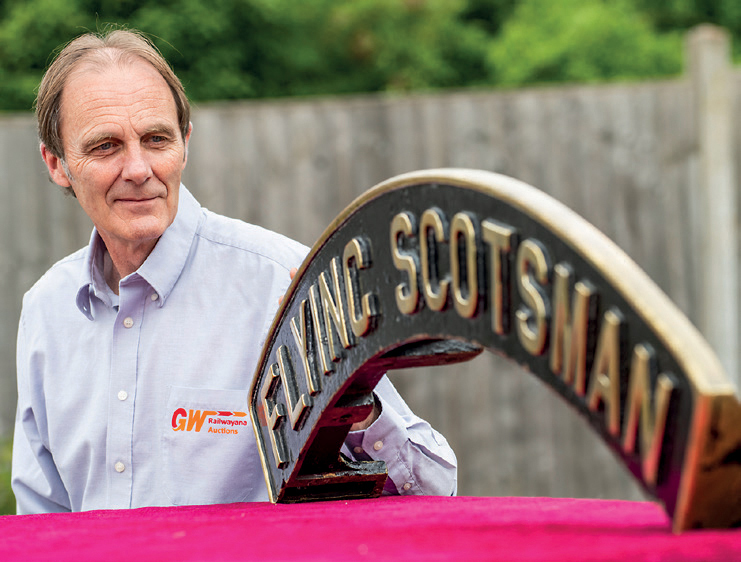 GW Railwayana director and auctioneer, Simon Turner, with the Flying Scotsman nameplate that sold for a record £64,500. It was bought by an online bidder on thesaleroom.com at Worcestershire specialist saleroom GW Railwayana Auctions on November 17, estimated at £30,000-35,000. The auction included more than 500 attendees, along with a lot of bidders on the phone, internet and in the room. The previous railway engine nameplate record was the £60,000 paid for a Golden Fleece nameplate in 2004, which was offered at Sheffield Railwayana Auctions. Despite the status of the Flying Scotsman, built in Doncaster 1923 for the LNER, it has experienced a complicated history since being retired from regular British Rail service. In 1996 it was sold to the late Dr Tony Marchington. Following a bankruptcy, in 2003 both original nameplates and workplates were sold into the railwayana world and the loco was fitted with reproductions. The 1.47m (4ft 10in) long Flying Scotsman plate, from the right-hand side of the engine, was consigned to this latest auction by the family of a collector. It was the first time either nameplate has been on public sale.